Even Swedish metal label Indie Records is jumping on the thrash band wagon. Well, ok, perhaps a single release isn’t necessarily bandwagon hopping but at least it’s a worthwhile one. These Norwegian youngsters came together a couple of years ago after taking their “talent show” project a little more serious. Now, with label backing behind them, the quartet have unleashed hell with their debut long player, Based on Evil and it smokes from start to finish. The title track really sets the tone for the rest of the album. It’s a balanced mix of all out thrash attack and slower, more dynamic passages. It very quickly paints a picture of Tantara as swinging between the likes of Slayer, Kreator, Testament, Overkill and Forbidden. Most importantly, it shows that Tantara have more than one weapon in the metallic arsenal and for the most part, they put their varied aural assault to good use. Guitarists Fredrik Bjerkø (who is also the band’s vocalist) and Per Semb have crafted some tight thrashing riffs and unload them in a savage manner than thrash fans will love. From up tempo, pit inducing monsters that drive Negligible Souls through to dark, heavy drawling passages such as the opening strains and the more delicate, clean interludes of The Debate, it’s clear that Tantara are keen students of Thrash 101. 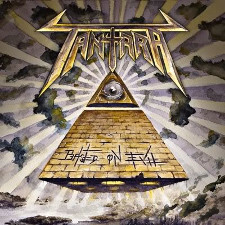 Throw into that mix plenty of harmony guitar leads and gang vocals to boot, and Based on Evil is a well rounded thrasher of an album. A couple of other things cannot be ignored when it comes to the vibe of this album. First is the production by the one and only Flemming Rasmussen of Metallica Ride The Lightning and Master Of Puppets fame. It’s not super polished or for that matter crisp and clean and this is a good thing. It has a raspy, dirty sound which only enhances the nostalgic throwback value for old schoolers such as myself. The intensity that these eight tracks exude is similar to early works from Bay Area thrash legends Vio-lence and Death Angel. The other thing that stands out is the vocal from their axe wielding frontman Fredrik Bjerkø. His style is quite unique which when you look at any thrash band that stands out from the pack regardless of longevity, the vocalist has a big part to play in that. Bjerkø performance is some kind of mix of one part Mille Petrozza (Kreator), one part Paul Baloff (Exodus) combined with smaller dashes of Don Doty (Dark Angel) and Bobby “Blitz” Elsworth (Overkill). It’s perfectly matched to the furious thrash storm that the rest of the band creates. Indie Records are definitely onto something picking up Tantara. This quartet thrashes as hard as any of the essential thrash acts from back in the day. If they can deliver a thrashterpiece like this at such a young age, the future definitely looks bright for these guys. Thrash fans, buy or die. This is essential thrash without doubt.